I stumbled upon this shot on a couple of different websites over the past week. I have no idea who took it or when, but it certainly reminds me of the thousands of miles (or at least what seemed like thousands of miles to a nine year-old boy) my brother and I spent on our Big Wheels as kids. Of course we jumped ours, but never to this level. The jump shown above looks better suited to a BMX bike. That is, until the log rolls out, causing a crash. 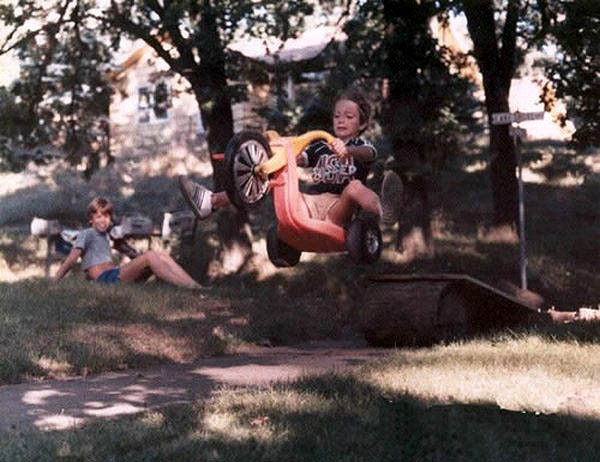 My mom hated seeing us ride our Big Wheels in the street as we were both low and loud. Not that she minded the sound, she just hated the fact that we couldn't hear cars driving down our street as the fat, plastic, hollow wheels drown out everything in a two-block radius. Still, the right rear-wheel handbrake made for some epic spin-outs.